9 September 2018 – Amman/Jordan: Generations For Peace is proud to introduce its new website, which is officially live. The revamped site includes a wide array of important updates that lend to increased user-friendliness, more intuitive navigation, and enhanced mobile compatibility. 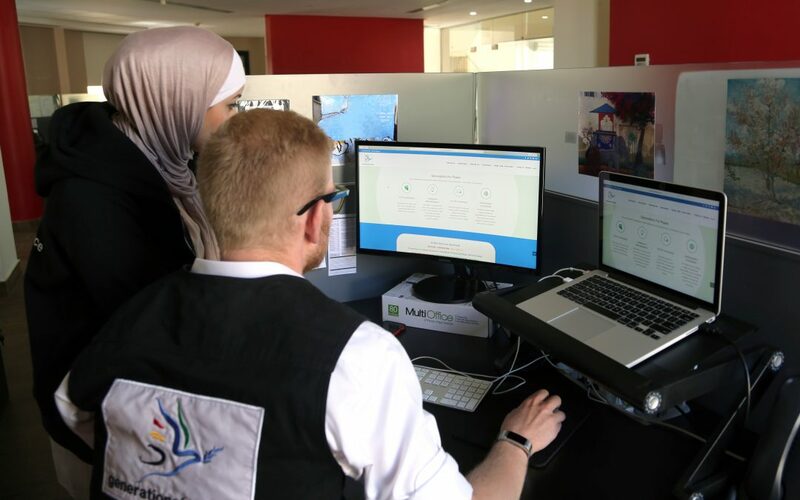 Designed to provide an engaging and informative experience with improved functionality, Generations For Peace’s website makes it easier for partners, volunteers, and other valued stakeholders to effectively utilise the online resource to find detailed information about Jordan’s leading NGO. The revamped site includes a complete Arabic counterpart, catering to site guests and organisation stakeholders whose preferred language is Arabic. It also includes an interactive map, complete with detailed descriptions of relevant contexts and the peace-building activities in each country with active Generations For Peace programming. All programmes run by the organisation can also be found on the site, allowing for a more thorough understanding of the NGO’s grassroots youth-led peace-building work across Jordan and around the world. Finally, for those interested in joining the team as a staff member at headquarters or as a local volunteer in communities throughout the twenty countries with currently active programmes, the updated website provides an easy-to-use application process. Generations For Peace invites visitors to explore its new website today, learn more about the organisation, and join us in empowering youth to lead and cascade sustainable change, building peace in communities experiencing conflict around the world.